This turned out so beautifully, Leanne! You really and truly quilted the life into this piece. :) Your choice of thread color just makes it pop and the dark blue frame for the binding is spot on as well. Amazing! It's beautiful. You should be very proud of this finish. 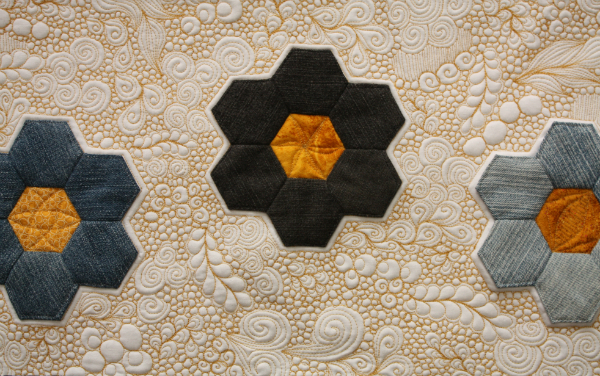 Love the denim hexies, and that is some serious quilting! Love the honey-coloured thread, the finished piece is all tied together so nicely. 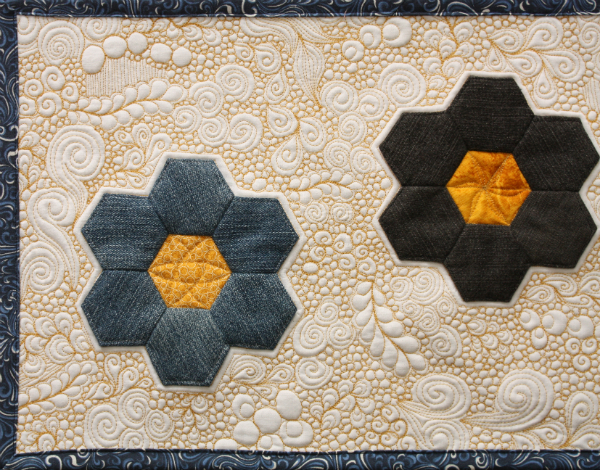 I love the texture on the denim which works so well but your quilting is wonderful. A great finish. Love everything about your little quilt and especially the quilting,it is fantastic. 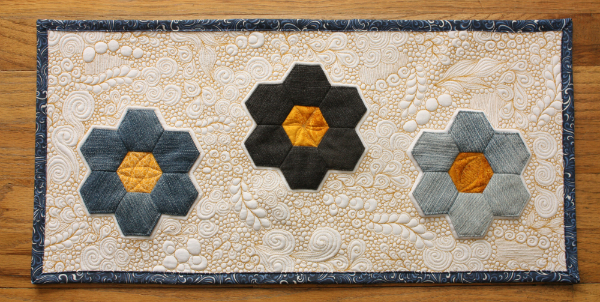 The quilting is the star in this piece and the lovely denim hexies play beautifully. I love it too!!! Wow!! Can't believe the before and after quilting photos - it doesn't look like the same material. What a great finish! Hi Leanne: I'm really enjoying your denim series. 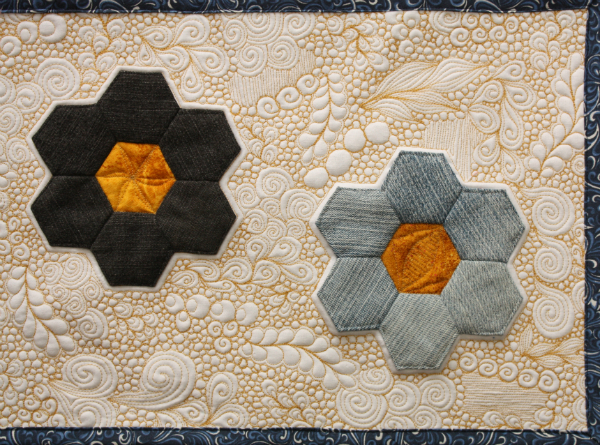 The hexy flowers look great and the fmq is awesome. The contrast between those last two photos says it all. What a difference between unquilted and quilted! But I also have to say I love the contrast between the rustic denim and the elegant background. Came out terrific! Love the quilting - it's always such a scary plunge (at least for me!) to take on something like that. I agree with your choice of binding, too. Nice! I really like how it came out. The dark binding was the right thing I think also. Love the quilting, so fun! Your quilting is amazing!! It was just perfect for this piece! Wow! Your quilting is stunning. Your quilting is fabulous. 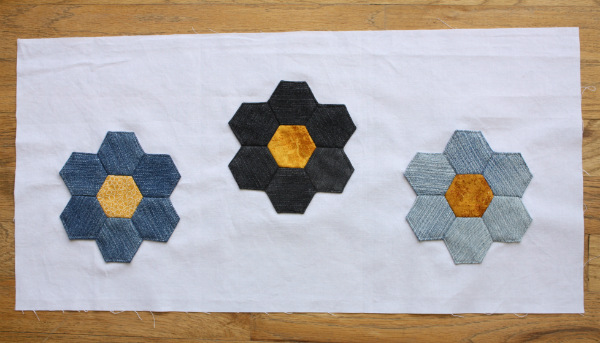 I would never have thought to use denim for hexies. Very cute. This is so amazing and you did such a great job! I love your flow quilting in the background. It turned out beautiful and is a successful experiment. Oh my goodness! This is inspiring. I just came across your site for the first time tonight and signed up right away for your bulletin. I'm so excited ... For the quilting and the Word. What a beautiful job you did quilting this small quilt.Wow. You are truly gifted.